Segway miniLite Kid’s Hoverboard Review – Is it worth it? 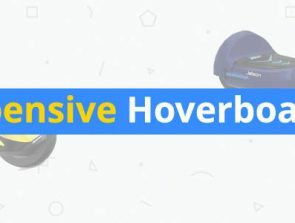 Although hoverboards have been a hit among adults who want a portable personal transporter for their daily commute, there is no doubt that kids yearn to experience hoverboards even more. In every holiday season, hoverboards are always one of the most popular gifts for kids. However, parents can hardly be blamed for being concerned that giving their kids poor-quality hoverboards will lead to injury. Recognizing this opportunity, Segway announced the Segway miniLite a little more than a year ago. Especially geared for young riders, the Segway miniLite is a smaller, lighter, and cheaper version of the Segway miniPro. It is also the most basic model out of Segway’s line of hoverboards. Is the Segway miniLite still worth it today? How does it fare as a hoverboard for kids? All things considered, the Segway miniLite looks just like a stripped-down version of the miniPro. It refrains from imitating the gaudy and colorful visuals commonly found in hoverboards that are geared towards kids. Instead, it maintains the minimalist and industrial design found in all Segway products. In either of the white and black variants, the Segway miniLite will probably fail to score your kid points in the coolness category. However, the fun riding experience should make up for the miniLite’s lack of visual flair. Like the miniPro, the Segway miniLite features the signature knee control bar. It is now padded for maximum comfort. Although the knee control bar is still detachable for easy storage, it now no longer has an adjustable shaft. Since the miniPro was designed for kids, the knee control bar is also on the short side. This means that for taller riders, the control bar might end up somewhere there along with their shins. It’s not much of an issue, though, as control is just as responsive and intuitive. At around 26 lbs., the miniLite is slightly lighter than the miniPro (which weighs 28 lbs.). Should your kid get bored of riding around the miniLite, carrying it along is made easier by the fact that the knee control bar now also doubles as a carrying handle. Despite the smaller size of the miniLite, it features the same larger-than-usual 10.5” pneumatic tires. It has the same hubcaps and fenders that protect you from debris and water spatters. Although the miniLite is not made with the same aircraft-grade magnesium alloy material as the miniPro, it still has an IP54 water resistance rating. This means that the miniLite can be safely used over wet roads without the water splashes damaging the hoverboard’s electronics. The miniLite is equipped with LED taillights with customizable colors and patterns. While visually appealing, the miniLite lacks the same level of night-time safety as the miniPro due to the absence of an LED headlight. 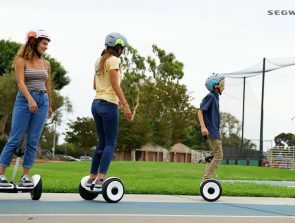 Since the miniLite is being marketed as a hoverboard for kids, Segway offers bumper kit accessories to protect the product from minor bumps and crashes. These bumper kits are available in blue, lime, and pink color variants and can be easily attached to the miniLite using its sticky inside surfaces. The miniLite is powered by twin 700W motors, a slight downgrade from the 800W motors of the miniPro. Accordingly, the miniLite only has a maximum payload of 175 lbs. Although this capacity is enough for most adults, larger adults may be a little too heavy. However, the payload capacity is no issue if you are considering getting the miniLite for your kids. Despite the power output of the miniLite being inferior to the miniPro, it still has the same 10 mph maximum speed limit. The 11-mile range of the miniLite is slightly smaller than the range of the miniPro but should be enough for riding around the streets for fun or the regular commutes to school. The miniLite is powerful enough to climb up sloped surfaces with an incline of up to 10 degrees. The miniLite is equipped with a 155Wh lithium-ion battery that takes around 3 hours to charge from 0% to full capacity. All components of the miniLite are certified compliant with UL-2272 standards, so you don’t need to worry about this hoverboard spontaneously catching fire or exploding even in the roughest conditions. The miniLite is recommended for riders ages 6 and above. This alone is telling of how easy riding the miniLite is. 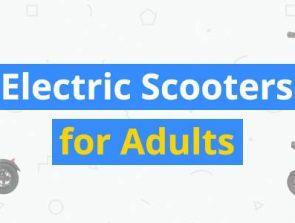 It even comes with a tutorial module that can be accessed using the Ninebot mobile app (more on the app later), which teaches you how to steer and control the hoverboard using a series of basic exercises. For the first kilometer of operation of the miniLite, it will be under Training mode. Designed to help the rider get used to using the miniLite, the Training mode limits the speed of the miniLite to about 4 to 5 mph. After the first kilometer, you are free to ride the hoverboard up to its maximum speed of 10 mph. Much like the miniPro, it feels like the miniLite is capable of reaching much higher speeds but is artificially limited by the hoverboard’s firmware. The innovative knee control bar is the key component that makes the miniLite an extremely intuitive hoverboard. With the miniLite, making turns is as simple as leaning in either direction using your knees or shins. This is a huge improvement to the ankle-twisting motion needed to make turns with standard hoverboards. The combination of high-precision sensors and responsive controls makes the miniLite accessible to just about everyone, as even inexperienced users will get the hang of it in just a few minutes. If you find the knee control shaft difficult to use, you have the option of replacing it with full-length handlebars. Segway does not sell this accessory, so you’ll have to look for third-party brands such as Mini4More. The suspension system of the miniLite is not as sophisticated as the one found in the miniPro. However, the 10.5” pneumatic tires still give you the benefit of shock absorption. The miniLite is still comfortable and stable even when you have to ride through small obstacles such as debris, potholes, and other uneven surfaces. The miniLite can connect to the Ninebot mobile app via Bluetooth, opening up a range of customization possibilities. You can use the app to set the hoverboard’s speed controls, steering sensitivity, and LED light settings. The app can also be used to display your current movement speed, location, and mileage. 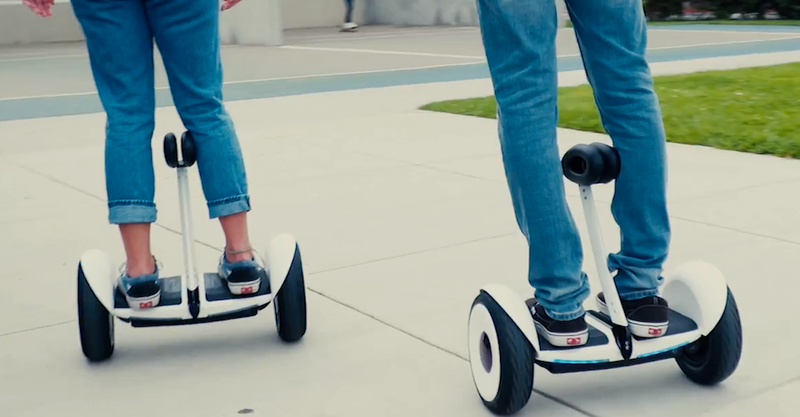 Segway has integrated a social element to their hoverboard products, allowing you to locate Segway users nearby and compare riding stats with them. We’re not sure if this is a feature parents would be comfortable using when their kids are riding the hoverboards. Thankfully, it can be easily deactivated through the mobile app. The mobile app is also required to access the training module and to update the hoverboard’s firmware. Remote unmanned control via the mobile app, which was previously available with the miniPro, is no longer supported in the miniLite. Another glaring omission is the lack of anti-theft measures, which was also available with the miniPro. The lack of these features is a disappointing downgrade, but perhaps these were measures that Segway had to take to keep the price of the miniLite down. The price of the Segway miniLite has not changed by much since its initial launch. Right now, a brand new miniLite will cost you between $320 to $350. This price tag lies somewhere in the middle: while there are certainly more expensive models, there are also cheap models that will cost about half of this figure. Ultimately, the question is: should you spend more than $300 for the Segway miniLite or settle for standard hoverboards in the $100 to $150 range? The answer all comes down to your priorities. The Segway miniLite is essentially a stripped-down version of the miniPro. It’s cheaper, but it’s also smaller, lighter, less powerful, and comes with fewer features. That being said, Segway is still an industry leader for self-balancing personal transporters. Despite the miniLite being Segway’s most basic hoverboard, it still offers better quality and a superior riding experience compared to most of the standard hoverboards available today. Segway markets the miniLite as more than just a hoverboard. In fact, Segway says that the miniLite is a safe and fun alternative to hoverboards. With its highly intuitive and responsive controls, perhaps it is justified to consider the Segway miniLite as a portable personal transporter. It comes with a lot of safety features, making it an excellent gift for kids. Not only will young riders have fun riding the miniLite, but their parents can also rest assured that their kids are riding a reliable and somewhat worry-free hoverboard. If you’re looking for a hoverboard for a kid or a young adult, then you can’t go wrong with the Segway miniLite. It’s a little on the pricey side, but every penny is worth the peace of mind that it offers. If you don’t have the budget for it, then you could pick one from our list of the best cheap hoverboards.